Do you know why I love Crocktober so much? It's because I find myself working with ingredients that I wouldn't normally use. Take pierogies for example. Sure, I've had them at polish markets when I travel, but they're not something that I've ever really worked with in my kitchen. Then a friend of mine told me about this recipe that she really wanted to love, but couldn't make work. 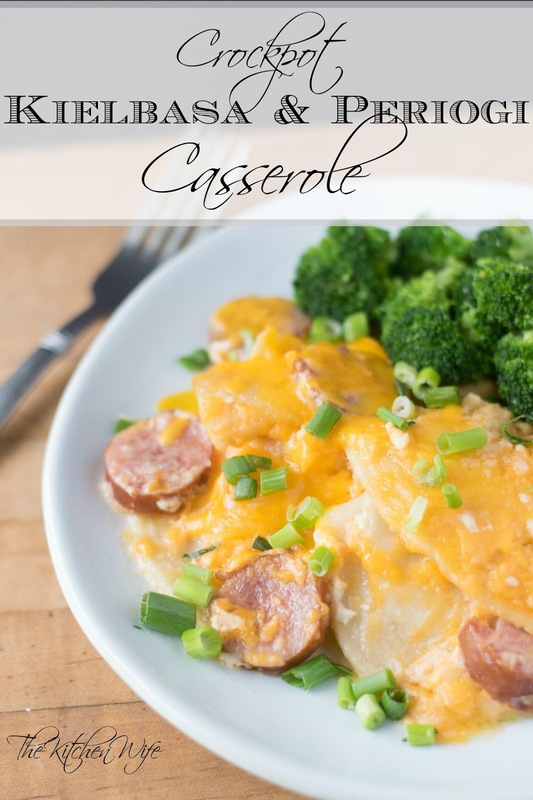 Challenge accepted and this Crockpot Kielbasa & Pierogi Casserole Recipe was born! To begin you will need to prepare your kielbasa and onions. Next, to keep clean up simple, line your crockpot with one of these awesome liners. Trust me, you'll be thanking me later. Now place one box of the frozen pierogies in the bottom of the slow cooker. On top of that, add HALF of the kielbasa and onion. Now add a 1/2 c of the cheese. Repeat that process one more time with the rest of the ingredients, making sure to save 1 c of cheese for later. Pour in 1 cup of the broth. Place the lid on your crockpot and set it to LOW for 5-6 hours. I cooked mine for 5. When there are 30 minutes left in the cooking time, you will combine 1 cup of chicken broth with the room temperature cream cheese in a sauce pan. Place it over a medium/high heat. Whisk the cream cheese into the broth until it is smooth and creamy. Then pour over the ingredients in the crockpot. If you see that bits of the cream cheese haven't melted don't worry. They will continue to melt while cooking in the slow cooker. Give everything a gentle stir and sprinkle the rest of the cheese on top. Place the lid on the slow cooker and cook for 30 more minutes. This is what it will look like when it is finished cooking. I know, I know, not beautiful, but it makes up for it in taste TRUST ME! And there you have it! 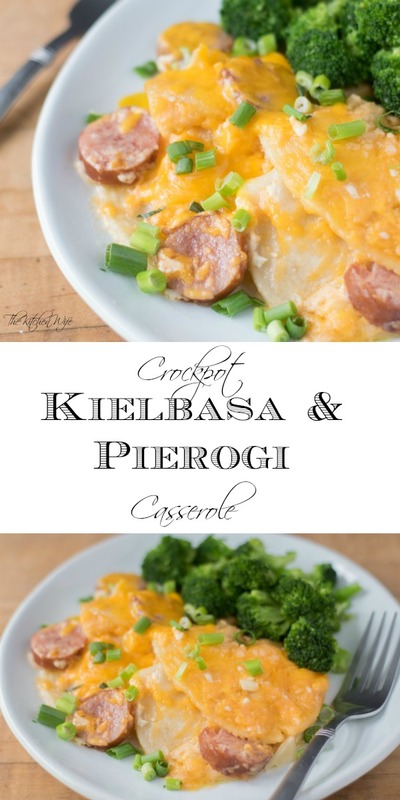 This Crockpot Kielbasa & Pierogi Casserole Recipe was everything I'd hoped it be. 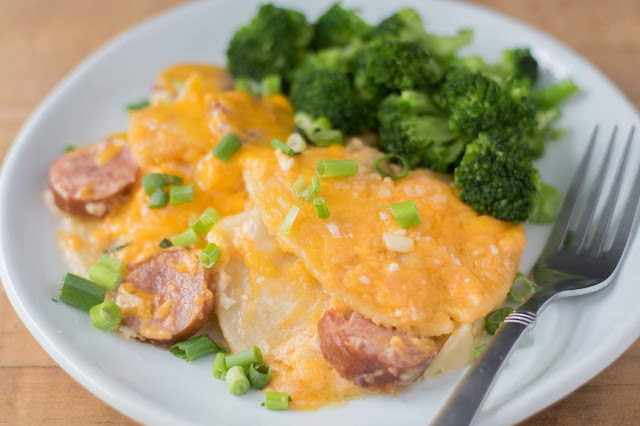 Warm, creamy, and hearty. The perfect comfort food meal and you made it in the slow cooker! I served this with some steamed broccoli and topped with some chopped green onions. It was delicious! I know you're gonna love it so get in the kitchen and give it a try TONIGHT! Place 1 box of the frozen pierogis into the bottom of the crockpot. Top with HALF of the kielbasa and onion. Sprinkle on a 1/2 c of cheese. Repeat this process with the other box of pierogies, the rest of the kielbasa, onion, and another 1/2 c of cheese. When there is 30 minutes of cooking time left combine the cream cheese with 1 cup of chicken broth in a sauce pan. Place over medium/high heat and whisk until smooth. Pour the cheese and broth mixture over the pierogies and kielbasa in the slow cooker. Gently stir everything together, top with 1 c of cheese, and cook for another 30 minutes.